It's Tuesday, which means it's time for some more inspiration for the Craft Heaven Blog using some gorgeous products from the Craft Heaven Shop. 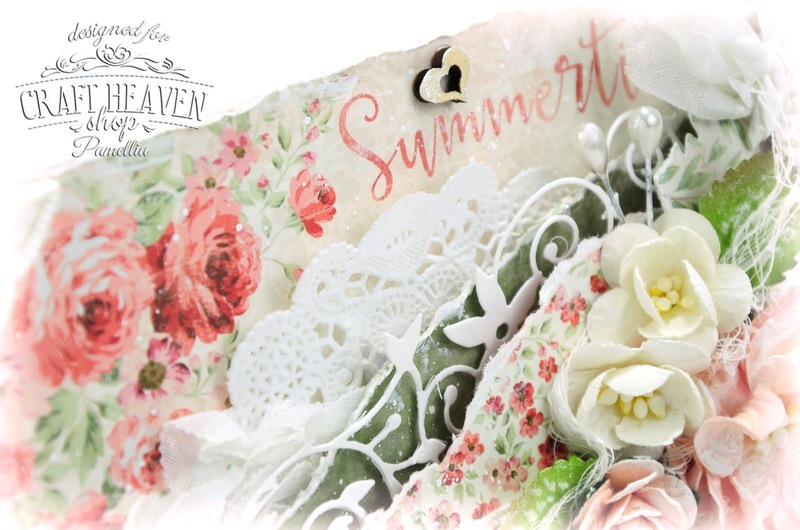 Our theme this week is Flower Scent, so I have used some floral papers from the new Maja Summertime collection to put together this floral card. OK, are you loving this colour or what!! Today I'm sharing some photos of our visit to the Kirkfield Lift Lock. I've heard Dad talk about this place my whole life. Apparently he had a hand in making it what it is today, so it was quite a treat to finally get to see it in person! It's a big giant elevator for boats, so freaking amazing! And we were lucky enough to pull in just in time for a boat to pull up, so we got to see the Lift Lock in action! And back on the home front, we have this beautiful Starling. Makes me a little nervous that he seems to be growing his winter plumage already! EEK! I was finally able to capture a shot of MR SCRUFF eating from my hand. So sweet! Note: I have to hold the food out between my fingers because if I put it in the palm of my hand, he thinks the ends of my fingers are nuts!! Ouch! Note: That absolute look of horror on his face, little guy is afraid of the camera of all things! HA!! My token after dinner shot. Tell me this one doesn't look like a totally cool painting! Beautiful piece! The background is lovely! And that starling looks mad! I worked with starlings..such beautiful birds! yes I do love that colour, and your creation is stunning as always. So very much to catch the eye, and you could keep looking and still find something you haven't noticed before. Great photos as as usual. Your friends the squirrels are sure cute. What a stunning card Pamellia..the colours are just superb..wonderful layers as always..just gorgeous..lovely to see the wee fellow eating from your hand and Junior's turn next..
Amazing Pamellia so much yummy embellishments and colours, gorgeous pictures too lovely to see something your dad was involved in too, I love seeing your little fur babies so cute. Oh what a gorgeous creation - it's beautiful!! Love the colours :-). That lift looks awesome - we don't have anything like that here! Love your wee squirrels - or starlings are starting to work up to mating, with all their posturing and performing here, which is quite early. 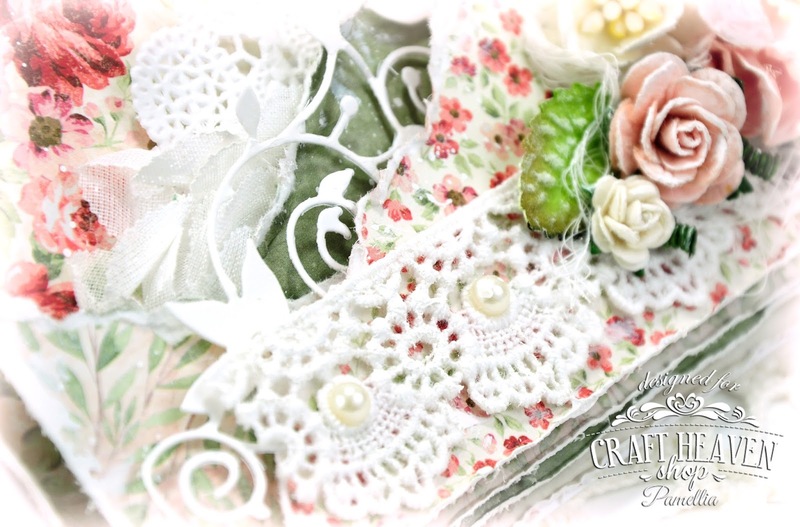 Gorgeous creation and gorgeous papers, love them, so vintage looking. Fab piccies love the one of Junior (of course lol!) Fancy waking the poor fella up, he looks quite mesmerised lol! AMAZING card - I am thrilled about it and the wee squirrel --such a sweetie--- gosh! Wonderful photos and art dear Pamellia! I do love the colours, they are gorgeous and so is your card, I love the beautiful little frame, it sets those tiny flowers off beautifully. Nice to see Junior came back for a visit, he is such a cutie. I definitely do love those colours. 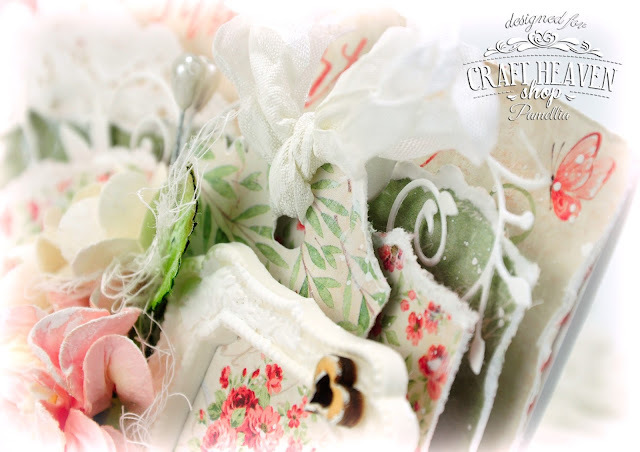 And the beautiful detail and layering on your card. Just gorgeous! I live near the Leeds-Liverpool canal, which has many Locks along the way, though none of the ones I've strolled past have been quite that size! Brilliant to see them in action though. Another totally awesome layered delight, Pamellia! 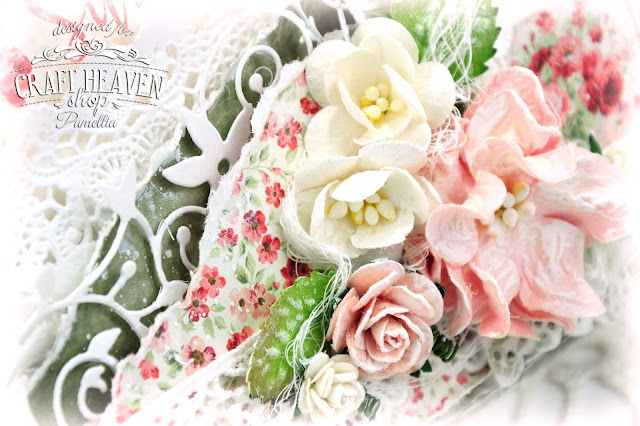 The flower card is stunning and I wanted to taste the flowers as they looked like icing ones. What a wonder you found to show us today with all its strength and industry. All in contrast to the beautiful pics of you 'Baby' How cute is that. Your flower cards Pamellia are always the best in blogland! Ah now I have to choose between Junior and Mr Scruff, who is the cutest little critter?! I always love pink and green (I feel me as an old girl LOL) and this card has a supersweet colours combo with your usual white! 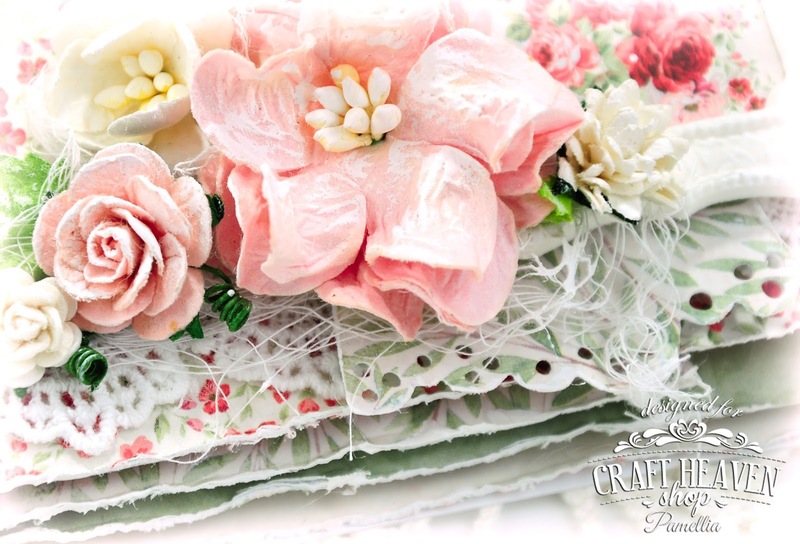 Such beautiful flowers on that papers and as embellishments! 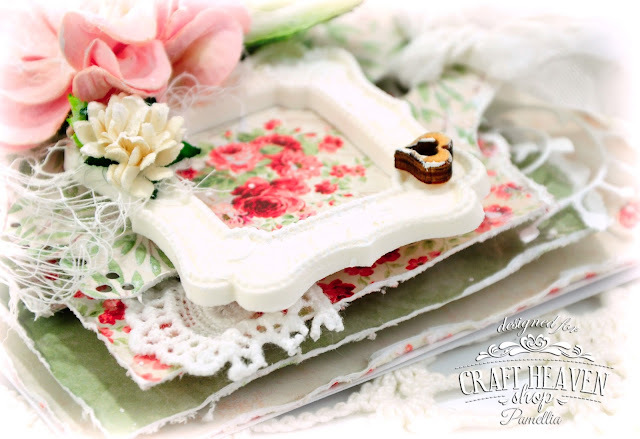 The lovely lace and the doily add a really scrummy touch of feminility, and the mold frame is so striking! Adorable work! I'm very impressed from today's photos, such a BIG Lift Lock! I have never seen one of these elevator, before now! But my favourite shots are always those of your sweet free friends :) Junior looks sooooo cute eating from your hand! Your token after dinner shot has surprised me: I haven't realized, before seen it, that you leave near a town! Great reflection, however, it seems really a painting. Gorgeous floral card today...love the colours and papers and of course the beautiful flowers! Fascinating photos too... all that 'heavy metal' such a contrast with your usual beautiful nature photos, great that you saw the lock in action! junior is so cute and photo of sunset is gorgeous! Beautiful card, Pamellia! Do you use 12x12 sheets of paper or 6x6? Great photos! with the papers from Maja! lovely card Pammelia! Oh, I am totally loving the colors!! Wow!! What a stunning card, Pamellia!! The layers are absolutely amazing!! I see something different every time I look!! I love every single detail!! It's spectacular!! 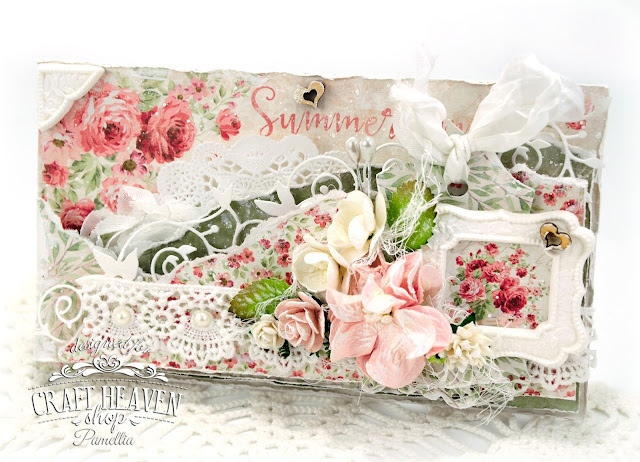 Summer on a card!! Pamellia, this is one of my absolute favorite cards from you EVER! I was already in love with this paper collection but of course you took it to a whole new level of beauty that my heart can hardly take. :o) The billions of layers, so softly snuggled together, are both whimsical and gorgeous. I love the frame you made, the flourishing die cuts, the pearly lace.. everything is spectacular. Beautifully dreamy work, my dear friend. Stunningly beautiful Pamellia, such lovely papers and design. I just love all the little details, and a wonderful idea to frame,a little corner of the paper making a feature of it. A marvellous feat of engineering, and to know your Dad was part of it is brilliant. 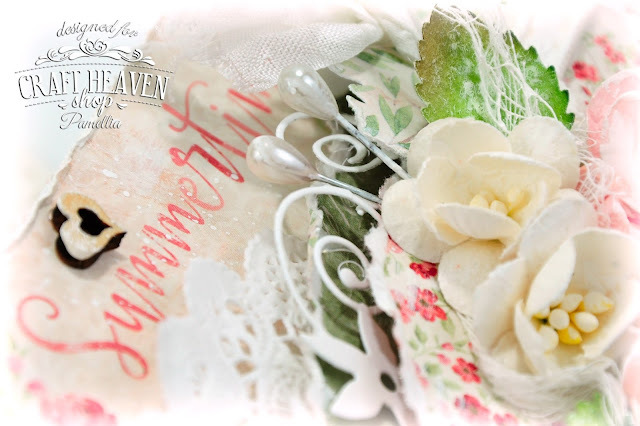 Reminds me of strawberries and cream. . . . .a perfect Summer treat as is this beautiful card. The papers are amazing. How fab to see this great feat of engineering knowing that your Dad had a hand in making it. You will keep visiting these places with loads of stairs lol! A gorgeous summer card, the colours are lovely. That is an amazing lift lock, engineering at its very best. Super photos and your last one deserves to be framed and hung on your wall. 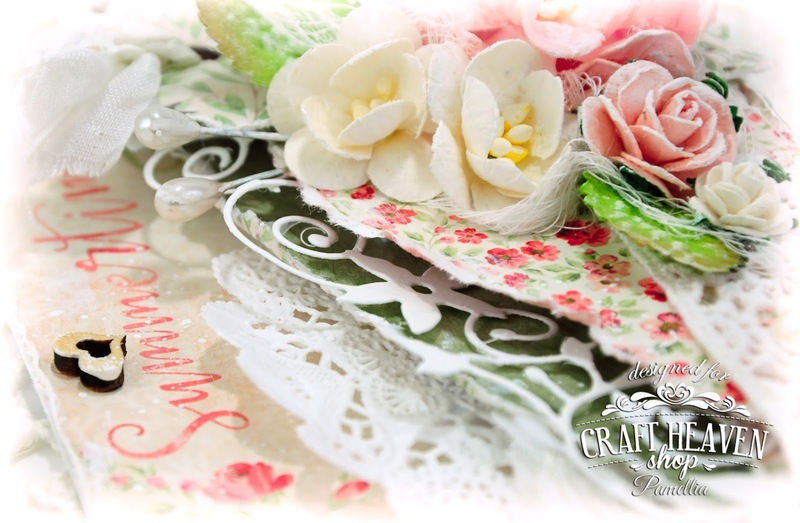 Gorgeous card Pamellia, love these beautiful papers, your colours and layers are amazing. great photos today, marvellous feat of engineering your Dad help to build..
wonderful photos shots of birds and squirrels. Another inspiring card, Pamellia! I am in craft heaven and those papers are scrumptious, like a strawberry sundae! Great to see the lift lock your Dad had a hand in creating! Wow! Mr. Scruff is A D O R A B L E! Your after dinner shot is gorgeous! Big hugs to you! A delightful and yummy card, Pamellia! Interesting post about the boat lift. And your fur friends are so cute! 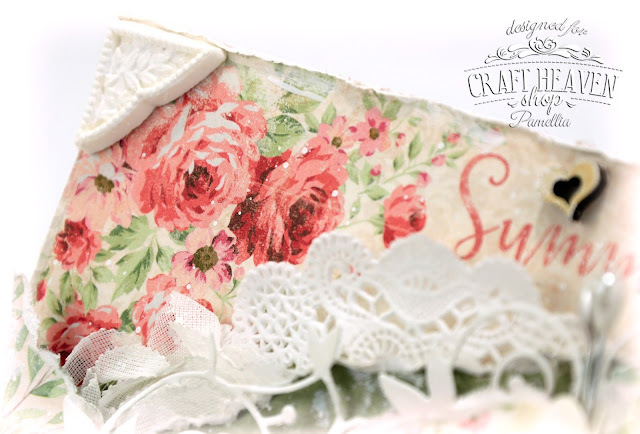 Such a lovely feminine card with all those pretty layers! What a super set of photos... That is an amazing piece of engineering! And as always your sweet animal photos are gorgeous! Gorgeous creation Pamellia and Junior looks so darn cute. A gorgeous floral creation with so many beautiful details and layers to catch the eye. I love these papers. Wow, what a beautiful card Pamellia. All of those gorgeous pinks, such pretty flowers - I can almost smell their heady perfume. Great design an really fabulous papers. The lift lock is quite fascinating and an amazing piece of engineering. Powerfully Precious creation. Seeing your babies are always the high point of my day. j. Your pictures once again are amazing! Wow, you are rockin' the pic's~so crisp! I LOVE the night shot and yes, it does look like a painting!!! Gorgeous! Your little Mr Scruff and Junior are doing great~they are so cute! Oh my gosh, my little Granddaughter would get such a kick out of it if we could get ours to come eat out of our hands! Maybe one day?! Have a a great Wednesday my friend! Amazing card and photos. Like always. 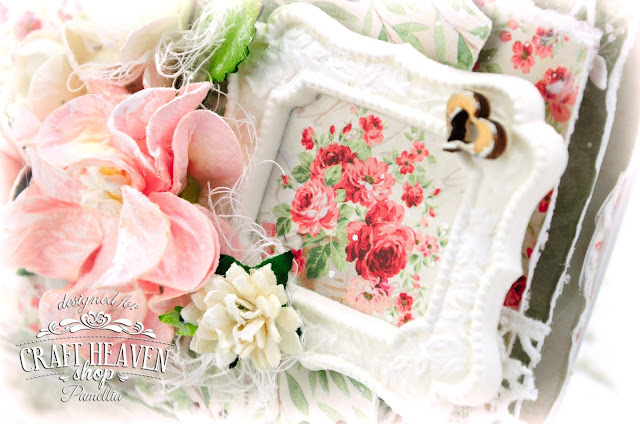 This is so very beautiful and Summery too, love the roses in the frame and the little heart. Your photos are always a delight. LOVE the sunset, you're right it does look like a painting. Oh my, Pamellia, what fabulous colors! Your card looks so fresh and full of summer! That frame is awesome and your layering is fantastic, as usual! I am so glad to see Junior is back! Mr. Scruff is so adorable! What a wonderful company you have there! Beautiful colours combined on this gorgeous stunning creation. That frame is gorgeous and just reminded me I have stashed some away... Love your gorgeous creatures...x.. Reminds me of the movie Pretty in Pink! Wonderful and fantasmic use of those papers and the Secret Garden vibe is awesome sauce. Are the corner pieces a mold? You sure have been a busy bee with all of these creative cards. Keep em comin dearie! Beautiful card, and that sunset is stunning. Oh! Don't you love those tiny wooden hearts? It looks delightful - just the right touch - on the pretty frame, encapsulating your love for Nature. All your projects are amazing, Pamellia. apologies for not leaving comments on each one. So sorry to not have caught up sooner. The lift lock is intriguing! I always marvel at architects, engineers, chemists, physicists, and especially quantum theorists! How do they think these things up? Historical engineering is still fascinating because they were still working with the knowledge and technological products of their age. Thanks for sharing the photos. 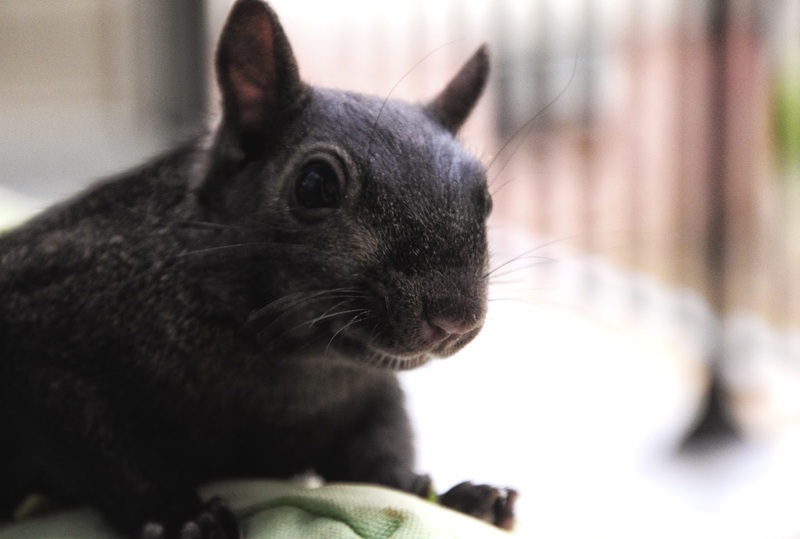 Your baby black squirrel is cute! I admire that you can hold your camera singlehandedly! I require two hands to steady the shaking LOL Junior looks happy and healthy as well.